In many of our lives, there are certain individuals who have made such a positive impression on us that we owe the persons that we have become, in large part, to them. Some, by their example, have consistently demonstrated a willingness to serve others with their time and talents. Our featured father this week is such an individual. So it is with great pleasure that I say our Upbeat Dad of the Week is James Davis. Few individuals have impacted my life to the degree that he has. You will soon know why I hold this man is such high esteem. His is a remarkable life – one highlighted by a consistency of service to his fellow men. James Davis is my uncle. He’s my mother’s older brother. If this post was being read by my family members only, I would refer to him as “Uncle James.” But since it’s being read worldwide, I’ll use “Mr. Davis.” I have known him for all of my life so most of the issues that I will share in this post, I have witnessed firsthand. Mr. Davis was born and raised in the rural part of Jamaica. When he became an adult, he migrated to England, as did some of his siblings. He lived and worked in England for 8 years yet somehow he desired to leave the life that he was afforded there to return to Jamaica to be of service to his fellow countrymen. In the late 1960s, he did just that - he returned home. He married the love of his life, Mary (also called "Meg"), and settled in the parish of Manchester. In Jamaica, he found the opportunity in which he could be best of service. Having been raised in a large family with two loving parents, he realized the importance of giving children the proper guidance and providing them with the best environment in which to succeed. 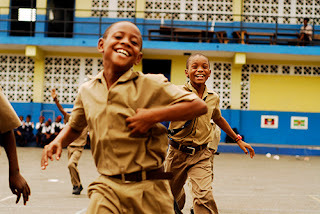 One of the issues that was quite prevalent in Jamaica at the time - and still exists today – was the fact that many children are raised without a father or father figure. And what often results is the stories that make headlines for the wrong reasons – i.e. crime, violence, etc. When positive father figures are present, children tend to make better choices and generally show more respect for authority. The government of Jamaica started a home for boys in the district of Mt. Olivet, Manchester. Mr. Davis became the superintendent of this home in the early 1970s. The home functioned as a stable environment for boys, many of whom knew nothing but instability prior to their arrival. Ranging from age 7 to 18, many of these boys were orphans. Others had loving parents who were not able to provide for them financially. As the chief administrator of the facility, Mr. Davis was given the task of creating the best environment for the boys to succeed. He hired the necessary staff and supervised their training to ensure that they were well equipped to shape and mold the lives of these boys. He had to ensure that for the years that each boy spent at the facility, they would leave equipped with the life skills they needed to help them pursue their dreams. He ensured that each boy at the home was given the best chance to succeed through education. Children learn in different ways; some need special attention in order for them to grasp the lessons taught to them. He was an integral part of the process to enable them to learn. He was not only the chief administrator but he was also involved in the carrying out of the functions of the Boys Home. In addition to ensuring that the boys got a proper education, he also taught them skills such as farming and raising livestock. In the rural part of the country, those skills are of vital importance. ﻿﻿Mr. Davis and his wife had 3 children, the oldest of whom was born exactly 4 weeks before I was. As a family, they served the community in different ways. His wife was a high school teacher. They both were leaders in the church and the community at-large. In the Davis home, love and discipline were demonstrated on a daily basis. In many of our homes today, the dinner table discussion is a lost art form. For the most part, now we just grab our meals at our convenience and then jet off to do other tasks. Or perhaps we sit in front of the television and are entertained while we eat. Not so in the Davis household. 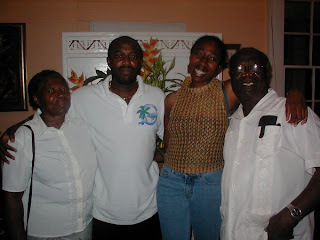 Even to this day when I go to their home in Jamaica to visit, breakfast, lunch and dinner are all family meeting times. There’s nothing to distract from the discussion – no television, radio or anything else. That way, there is necessarily a closer bond that is formed. For his children, education was vitally important. But more than that, service to others was strongly encouraged. As adults, each of them has contributed immensely to the well-being of others. Their oldest, a son named Orville, was a youth minister in his church. He mentored and encouraged young people. The second, a daughter named Janice, is an educator. She is currently a teacher in Japan – where she teaches Japanese students how to read and write the English language. 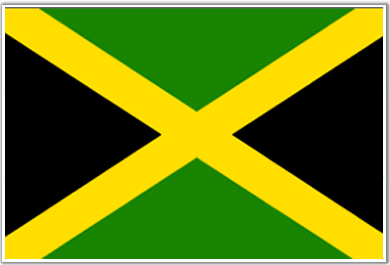 The youngest, a son named Cleon, is a doctor in Jamaica – an anesthesiologist. He serves others with his gifts through the medium of practicing medicine. As is often the case when we learn about the lives of great people, Mr. Davis’ story has had a very difficult chapter. On Christmas Day 1998, Orville had traffic accident that claimed his life. That was a bitter pill to swallow for each of us in the family. It was particularly tough for a loving father to lose his firstborn child in such a tragic way. Orville was my closest cousin and best friend so his loss was very difficult for me to deal with as well. But today, over 12 years later, collectively as a family, we have come to accept that we cannot control certain occurrences in our lives – we can only do our best with the challenges life throws our way. Mr. Davis served at the Boys Home for 20 years before leaving to become a church minister, continuing to be of service to others. Both he and his wife have since retired and reside the parish of Clarendon. They are actively involved in their community, still giving of themselves for the advancement of others. With all the work that he has done throughout his working years, I believe that his legacy will most be defined by the work that he did at the Boys Home. The boys came to the home at the most vulnerable stage of life. Without his labor of love, many of them might not have become the successes that they are today. Most of them have gone on to successful vocations and have started families of their own. I consider myself a child advocate so as I reflect on the life of service that my uncle has given to these young lives, I have to applaud his efforts. Rodrick in Jamaica with "Uncle James" and "Aunt Meg"
Please join me in recognizing Mr. James Davis as the Upbeat Dad of the Week. His life and example have left such as impression on me that I constantly think about how I, too, can serve others with my life. Many people look at the problems of the world today as simply spectators. But he has viewed the same problems and has dedicated himself to eradicating them. He has fathered 3 biological children but so many other children have become good citizens of this world today because he chose to father them. It is for this reason that I recognize him in this way. As always, if there is anyone you would like to nominate as our Upbeat Dad of the Week, please do so by sending an email to info@theupbeatdad.com. We love to share stories of positive fathers and father figures for the ways in which they touch the lives of others. James Davis is one who has so given to others that his legacy will live on perpetually. I know that my life has been changed by his example. I hope that your life will be as well. His commitment to selfless giving has endeared so many to him. I hope that after reading about his life of service, you too will dedicate yourself to the well-being of others. Have a wonderful day. I attest to all that has been shared here. He is truly a servant leader, a humble soul, and one who is revered far and wide. 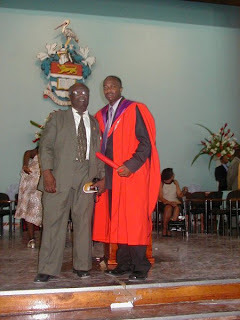 Kudos to Uncle James...my father elect!! !